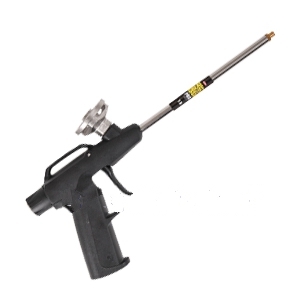 PRODUCT: Dow # 230408 PRO-13 Economy Foam Dispensing Gun Kit. Included 2 extension nozzles, 2 cone tips, 1 replaceable brass tip. Gun is used with Great Stuff, Enerfoam Foam, etc. Price/Kit. DESCRIPTION: A convenient yet disposable grade tool for use with all Great Stuff Foams. Features lightweight, good bead control, variable bead size control, barbed dispenser tip, less foam waste, and no post-dispensing foam drip. Includes two 8 plastic extension tips, 2 cone-shaped dispensing tip sand one barbed brass tip (replaceable). DOW #259200 Barbed Brass Dispensing Nozzle / Gun Tip. Fits PRO-13 / PRO-14 Foam Gun Tools. Barbed Tip allows use of plastic extension straws (not included). Price/Each. Dow #259205 DOW GREAT STUFF PRO CLEANER (can only, no gun). 12 OZ AEROSOL CAN. PRICE/CAN. (Flammable; UPS GROUND SHIPMENT ONLY). Versi-Tite Expanding Polyurethane Foam Sealant, UL Rated and with flame retardant.Case of twelve, 24 Oz. cans. Price/Case. (Gun NOT included; UPS Ground Shipment Only).